With a hugely successful ‘Walk for the Cure’ campaign, CIBC FirstCaribbean once again helped capture the generous spirit of the Cayman community, as more than 900 participants took to the five-kilometre course, raising funds for the Cayman Islands Cancer Society. “The response we have had to this year’s ‘Walk for the Cure’ has been nothing short of phenomenal, with more than four times the number of registered walkers from last year,” said CIBC FirstCaribbean Walk Manager, Shadden McLaughlin. 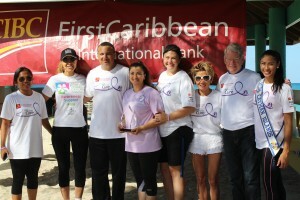 Now in its fourth year, the ‘Walk for the Cure’ fun run/walk, took place on 4 October, starting from Public Beach. ‘Walk for the Cure’ is a regionally coordinated annual event for CIBC FirstCaribbean, which aims to have all of its employees walking at the same time, as part of a collective fundraising effort to defeat cancer. With events held across the bank’s network of 17 Caribbean territories, over 20,000 people joined in the walks, collecting over US$ 350,000 for 2015, far surpassing the US$ 190,000 raised last year. A significant portion of these funds will be donated to the Cayman Islands Cancer Society and for the Cayman branch, this year’s walk was especially poignant, following the sudden death of beloved Head of Corporate Banking, Al Aaron, who sadly lost his battle with cancer earlier this year. Nine members of the Cayman branch, plus a former employee in the 200 strong crowd, shaved their heads at a special event in September, which raised nearly US$ 3,000 towards the grand total. CIBC FirstCaribbean’s staff began their fundraising drive in March of this year, with dress down days each month and more recently a car boot sale and a bake sale. All proceeds will go directly to the Cayman Islands Cancer Society. Funds raised in Cayman from all activities currently stand at over US$77,000 and still counting. “We are truly grateful to CIBC FirstCaribbean and the many sponsors who have joined their efforts to make a difference, in Cayman, the community we all call home,” said Jennifer Weber, Operations Manager at the Cayman Islands Cancer Society. She commented that CIBC FirstCaribbean’s achievements were incredible. “This event started out for employees and has grown to include the whole community, which is a philosophy that makes sense to us, because the Cancer Society has been here for the whole community since 1995. “When CIBC FirstCaribbean decided to dedicate their Walk for the Cure, in memory of their beloved employee, Mr. Al Aaron, it struck a chord with the community, and the overwhelming support is a beautiful testament to him. We are always moved by the kindness and generosity of the people in this community, and want to thank everyone involved in this monumental effort,” she added. In addition to a raffle, refreshments and giveaways after the walk, there were cancer specialists on hand to provide advice and support to the community, including breast cancer experts, the board of the Cayman Islands Cancer Society and a doctor from Cancer Treatment of America. Since the inception of the Walk for the Cure in 2012, CIBC FirstCaribbean has collected over US$650,000 to date with fundraising continuing through the month of October. CIBC FirstCaribbean would like to thank the regional and local sponsors of the 2015 Walk for the Cure: Deloitte, Fujitsu, TATA Consultancy Services, Ogier, Mayer Brown, The Imparato Family, Kirk Group, Walkers, Z99, The Rooster 101.9, Chrissie Tomlinson Memorial Hospital, A.L. Thompson’s, Governor’s Square, RUBiS, Tortuga Rum Cake Co., MourantOzannes, Kirk Office, Appleby, E3 Wine School, Enhance Group, Solomon Harris, Foster’s Food Fair-IGA, Ritch &Conolly, Superior Auto, Conyers Dill &Pearman, Health City, NCB Homes Ltd., Red Sail Group, Scotts Marine, High Impact Media, A-I Rentals, Miseen Place, Jacques Scott, Zolfo Cooper, Campbells, Flowers Group, The G.T. Automotive Group, Virgin, Artista Salon, The Tasting Room & Wine Cellar, World Gym, Captain Marvin’s, Carlos & Martin’s, Café Del Sol, Funky Tang’s, Cayman Marine Lab and Lobster Pot.